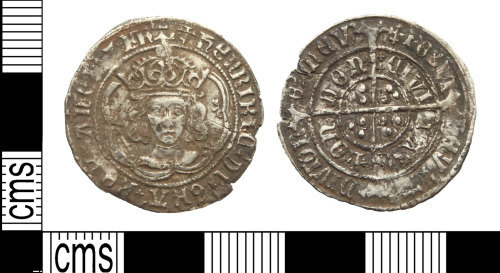 Silver post-medieval hammered groat of Henry VII, dating to 1504 - 1505 AD. Class 3c. Cross-crosslet initial mark. Mint of London. Obverse of forward-facing bust with double-arched crown, with one plain and one jewelled arch. Die-blundered legend: HENRIRIC DI GRA REX ANGL Z FRA. Reverse of long cross fourchee with three pellets in corners; POSVI/ DEV' [A]/DIVTOR/E' MEV'// CIVI/TAS/ LON/DON. Saltire stops. The coin is 26.68mm in diameter, 1.04mm in thickness and weighs 2.88g.